AMI's high-efficiency, superinsulated, and vacuum-jacketed transfer line is designed for helium transfer between standard helium storage dewars and magnet system dewars. 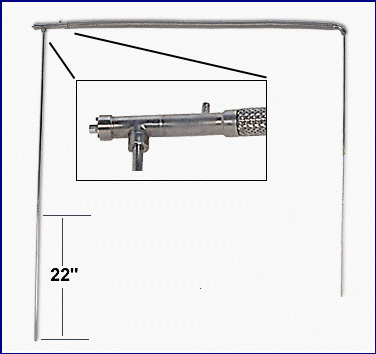 The transfer line is manufactured with a 60 inch flexible section and 60 inch dewar legs. An AMI liquid helium level sensor is contained in the lower 22" of the end of the transfer line which inserts into the liquid helium storage dewar. As the level in the storage dewar decreases to 22" or less from the end of the transfer line, an instrument connected to the integral sensor will give an accurate indication of the helium liquid level for the remainder of the transfer. The sensor is compatible with all AMI liquid helium level instruments. Construction is such that the sensor is field replaceable should it ever need service. Each transfer line comes standard with 25 feet of interconnecting cable, integral sensor, and a vacuum evacuation valve. Please specify which AMI instrument will be used in conjunction with the transfer line to ensure the correct mating connector is furnished. When used with the affordable, hand-held Model 150A, you have an incredibly versatile liquid helium transfer system. AMI’s liquid nitrogen transfer lines are designed for convenient and efficient transfer of liquid nitrogen between standard nitrogen storage dewars and research dewars. These transfer lines are constructed of non-magnetic stainless steel and are available in either vacuum-jacketed or non-vacuum-jacketed configurations. Vacuum-jacketed transfer lines are surrounded with multiple-layer thermal radiation shields and vacuum insulation for minimal heat losses. Non-vacuum-jacketed lines are covered with a flexible, interlocking armored outer layer for protection. Nominal length is 72” and customer lengths are available. AMI offers support stands for magnet systems associated with bucket-style or similar dewars where the magnet assembly is installed vertically and mounted to the dewar top flange. These support stands hold the magnet in position and provide attachment points for current leads, liquid level measurement instruments, electrical connections, fill and vent ports, and other associated equipment such as blow-out tubes quench relief ports. 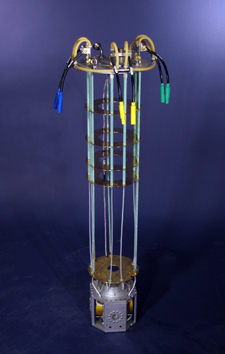 AMI support stands are designed and constructed of low-thermal conductivity materials for minimum cryogen losses. AMI support stands can be designed to allow vertical access to the magnet bore for custom instrumentation or cryogenic inserts.